Freewheeling down the Kingpin side of the A12 pedestrian bridge, I'd eyeballed a bunch of old buildings morphing into shiny new premises c/w glossy tarmac car park. Never did I dare to dream that one day we'd be undertaking an outing to Unit 1A. And yet. 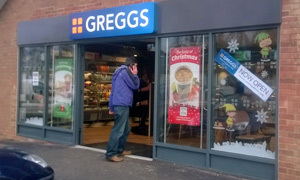 Balloons have all been popped since last week's inception: did you know that every single branch of Greggs is opened by somebody of that name? Proops to whoever came up with that idea. Double doors are open and, like that Python sketch of Thomas Hardy writing his new novel, the crowds are loving it. They're arriving in their droves and other vehicles. Back to those doors: despite the seasonal temperatures, they're kept open. Blinkin' freezin' inside. I guess it discourages dwell-time. Everything is freshly made today, reads the sign. Someone's setting their alarm clock for an ungodly hour given their 7am start. Pros and cons of a chain are that you know what's coming, hence there's not an ocean of changes since we did the Ipswich branch. Squillions of sausage rolls sit above a plethora of pizza slices and a felicitous forest of their famous festive bakes (chicken, not turkey). Beanie Kev and pedestrian Andy make like The Specials and Do The Dog while I bag a roast chicken bloomer and energy-giving Lucozade. Both are a bargainous £3, i.e. more reasonable than rational Rene Descartes. While we're sat there in the chill, those punters keep on coming. Wonder where they all used to buy their warm savoury slices? Couple of quid left from that none-too-crisp fiver buys you the dessert deal. It'd be a fool who said no to coffee and cake for that price, esp. since a latte is £1.75 on its lonesome. Friday equals fresh cream aboard an apple Danish slice. See also Andy's positively rude Belgian bun. Hot coffee plus yum-scrum sweetness. Spot very much hit. Grazie, Greggs. If it was a car -- Vauxhall Astra Excite. If they were passing by -- Greg Rutherford.